You’re not a covert-operative. You’re not the President of the United States. 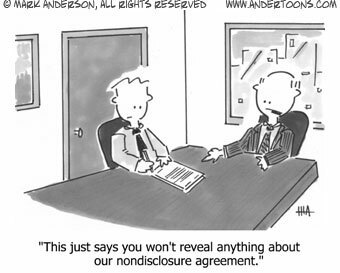 You certainly don’t have the answer to the age-old question “WHY?” So now that we have that out-of-the-way, hopefully I can explain why I will not sign your non-disclosure agreement. First of all, if you are somehow at a competitive disadvantage by telling me your business model, then I’m not going to invest in your plan. Second, I am not in the business of stealing entrepreneurs ideas, I am in the business of investing in entrepreneurs and helping them succeed. If I sign your NDA, does that mean I need to sign the other 500 NDA’s that come across my desk every year? I’m not smart enough to keep track of that many legal documents! I completely understand the paranoia that comes along with your great idea, but trust me, you are not the first person to come up with that idea, and there are probably 100 other people out there working a similar plan. I am not interested in your idea anyway, I am more interested in your ability to turn that idea into a viable business. I turn down NDA’s on a daily basis so I felt like putting together a blog post that I can point people to. If you don’t believe me, or don’t agree with my reasoning, then check out what Guy Kawasaki or Brad Feld have to say about NDA’s. They provide even more reasons VC’s won’t sign NDA’s. Bottom-line: Don’t ever ask a VC to sign an NDA because A) they won’t do it and B) they’ll probably be turned off by it. Let us review your plan, be open about it, be proud about it. We’ll at least provide you valuable feedback and if we believe in you as an entrepreneur, we might even make an investment! Then you won’t be signing the next truly big idea…the next ebay. Truly “revolutionary” ideas and technology are always secured via NDA. Keep your money…i’m going to deal with the reasonable VC who is truly looking for a partnership with his entrepreneur. I hope you find a VC who will sign your NDA, I also hope you get funding, but hope and reality are two different things. The sooner you realize my advice is genuine and accurate the sooner you can start sharing your plan with legitimate investors and start focusing on executions, which is where the value is really created!